For all four planets a very thin light gray or white line represents the few hundred miles near the "surface" of the planets that consists of compressible gases. 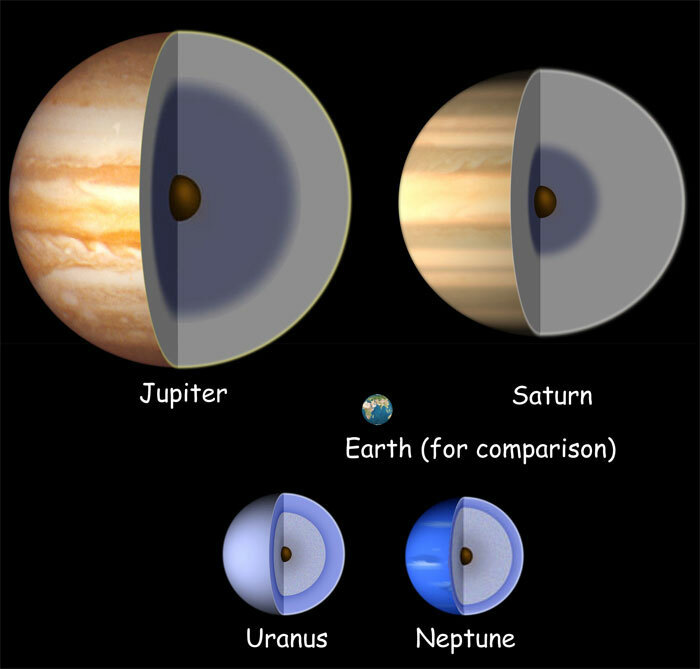 The slightly darker gray (for Jupiter and Saturn) or blue (for Uranus and Neptune) regions represent gases compressed to the density of a liquid and are therefore nearly imcompressible, and although technically still gases because of the high temperatures inside the planets behave far more like liquids than "normal" gases. The dark gray regions in the diagrams of Jupiter and Saturn represent "metallic" hydrogen, hydrogen compressed to the point where some of the electrons in the hydrogen atoms are wandering freely between the atoms, giving the region heat and electrical conductivity similar to that of molten metals. Neither Uranus nor Neptune has enough pressure within the hydrogen region to create metallic hydrogen, so there is no such region shown in their diagrams. For Uranus and Neptune a whitish area comprising most of the apparent bulk of the planet represents "ices", or materials that are liquids or gases in our experience (such as water, methane and ammonia), but are compressed to liquid or solid states by the weight of the layers above them. For reasons discussed in the page on the magnetic fields of the planets, at least part of the "icy" portion of Uranus and Neptune must be either liquid or partially liquid. For those two planets, the dark central region represents a rocky core. But for Jupiter and Saturn, the central core of ice and rock is so small in comparison to the overall mass of the planet that its mass and size are more a guess than anything else, and the dark brown regions represent both an icy outer core, and a rocky inner core. Jupiter consists mostly of liquid hydrogen, a large portion of which (shown in darker gray) is metallic hydrogen. Deep inside, an icy core must overly a rocky and metallic core, but the size and mass of these cores is too small to significantly affect observations of Jupiter's properties, so we can only make educated guesses as to their size. The structure of Saturn is similar to that of Jupiter, but it is much less compressed under its weight, so it has far less metallic hydrogen. Uranus and Neptune have relatively small amounts of hydrogen -- just a few Earth masses -- above their icy and metallic cores, so we can be more confident about the structure of those cores. For Neptune, which has more mass than Uranus but is smaller, the core must have most of the mass, while for Uranus the hydrogen "mantle" must be more significant, and perhaps even exceed the mass of the core.